Loch Fyne offer an online seafood and larder ordering service and is probably best known for the oysters that they grow naturally in the waters of Loch Fyne, Scotland. Loch Fyne works closely with the Marine Conservation Society and uses only sustainable methods for farming. The oysters feed on plankton and no artificial feed is used. 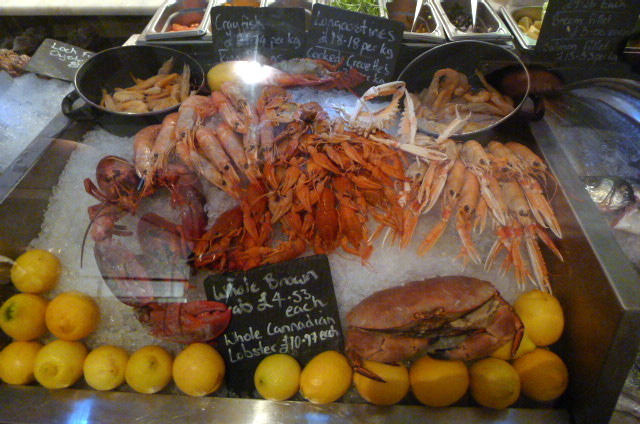 In addition to the oysters, Loch Fyne also farm a variety of fish, again using only sustainable methods. Their fish stocks are also topped up by their wild fish catches that are landed from the waters off Cornwall and the South-West. The online business is only one part of what Loch Fyne do. In addition, they also operate 42 seafood restaurants throughout the UK. There are two in London, one of which is on Catherine Street in the theatre heart of Covent Garden. The restaurant has a charming brasserie feel to it and oozes warmth and congeniality. At the back of the restaurant is a seafood counter that displays the seafood of the day. It’s a really good way of checking out the freshness of your seafood before your order. The cold platter as a starter for two (or as a main for one) contained some Loch Fyne oysters, scampi, langoustines, king prawns and smoked prawns (£21.45). The oysters were fabulous. Served with a selection of vinaigrettes, they were meaty and sweet with a gentle mineral flavour. The scampi were also sweet, the langoustines and king prawns were fair but not amazing, and the smoked prawns were quite salty. On the whole, this was a decent enough platter, but the oysters far outshone the rest. 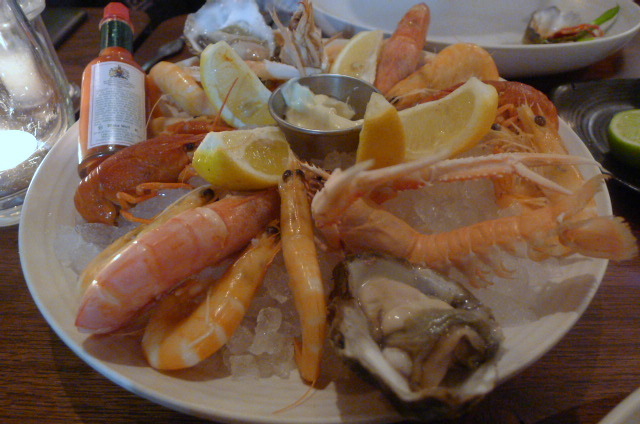 If I were to visit Loch Fyne again, I’d skip the platter and order just the oysters. 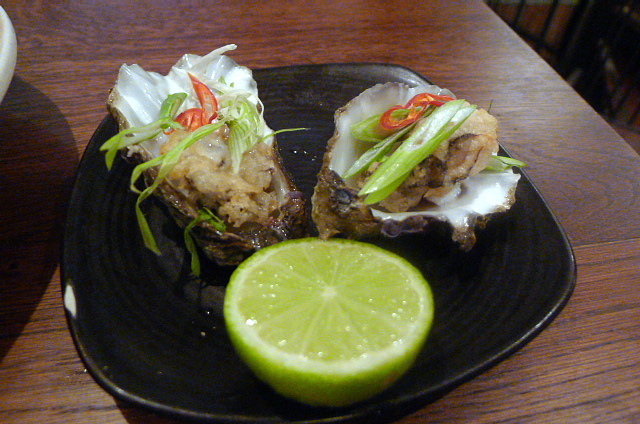 We also tried the oyster in tempura batter with chilli jam (£2.45 each). The batter was quite dense and by the time it reached us it was soggy from all the moisture in the oyster. The chilli jam was also too thick and didn’t quite have the right texture. On the whole, the tempura oysters did not work, and the oysters were definitely better on their own. 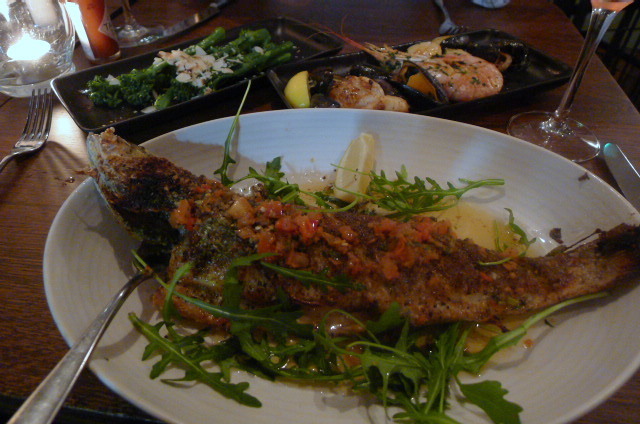 From the specials, a whole sea bass with a chilli and tomato pesto (£19.95) was wonderful. It was very fresh, as I knew it would be from my inspection of the seafood counter. Baked with a breadcrumb crust, the sea bass had been beautifully cooked and was moist and delicious. The crumbs worked to great effect as it gave the fish a crunchy bite. The pesto wasn’t particularly spicy, but the tomato was a nice touch. This was a fabulous course. With each main you can complement your meal with a medley of seared scallops, a grilled king prawn and steamed mussels (£3.95). It wasn’t really needed, given how big the fish was. 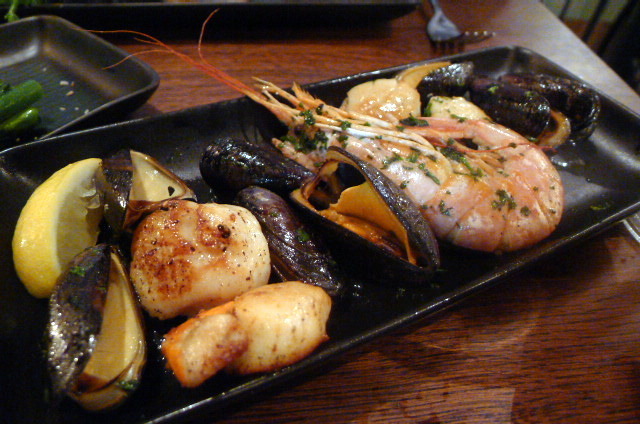 Also, even though the scallops were nicely done, both the prawn and mussels were very bland so perhaps it was better to have been missed. From the regular menu Loch Fyne offers you the option of choosing your fish, how you want the fish cooked, what sauce you want with it and the option of two sides. A farmed gilt-head bream (£16.55) turned out to be quite a small piece, and because it was small, it could have done with a couple of minutes less cooking time for a moister finish. Nevertheless, it was still fresh and tasty. 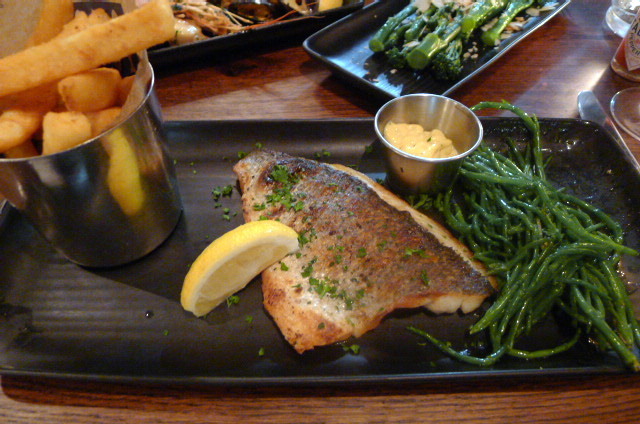 For our sides we went for the twice-cooked chips and pan-fried samphire in garlic butter, both of which were excellent. The chips were soft and fluffy in the middle and crispy on the outside, and the samphire gave way to a nice crunchy bite. 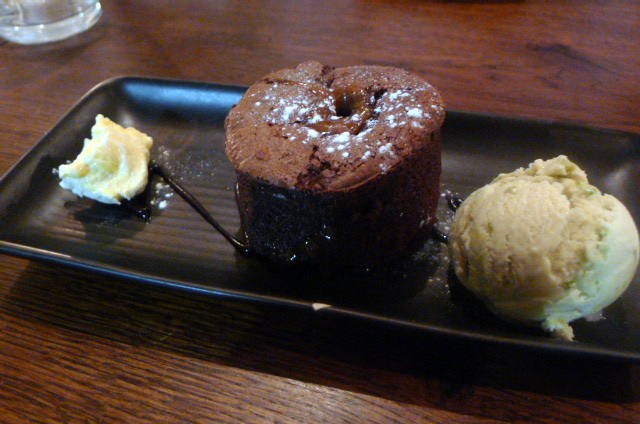 A dessert of warm chocolate fondant with salted caramel (£5.95) was scrummy. The fondant could have been runnier at its core, but the salty and sweet flavours of the caramel running through the chocolate worked a treat. It came with clotted cream and pistachio ice cream, the latter being rather average. 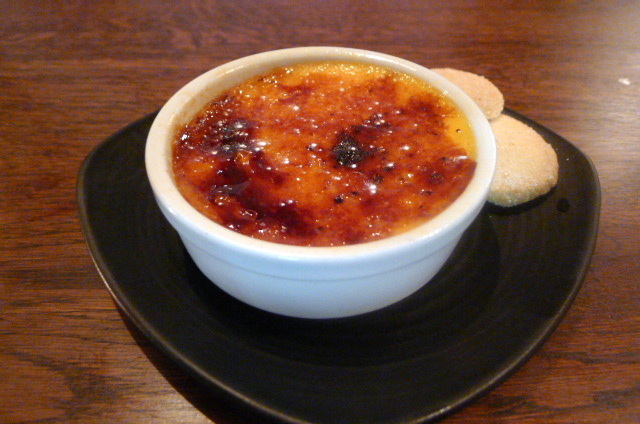 A crème brûlée with shortbread (£5.45) was a little eggy rather than creamy as good traditional crème brûlées ought to be. A touch more vanilla was called for, but it was still rather tasty and satisfying. The mains and the oysters were the outright winners of the day, especially the whole sea bass, which proved to be excellent value given its size and how well it had been cooked. The desserts were also commendable, perhaps not perfect from a technical point of view, but they were yummy and enjoyable nonetheless. The service was also lovely, although again not perfect. Some of our condiments were forgotten during the service, but the charm of our waiter more than made up for it. Loch Fyne is a dependable and reliable dining option with reasonable prices, and the Covent Garden branch, right in the heart of the theatre district, makes it an easy pre-theatre choice. Price range: £22 to £43 for 3 courses. Excludes drinks and service.